SKU: tokogoldGSC1. Categories: weed vape pens, CO2, Indica, Refill. Tags: Toko, Vape Pen. Discreet. Distinct. 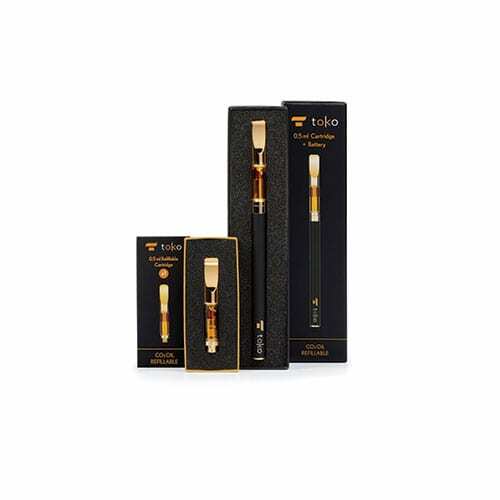 Disposable... Toko Gold with a Girl Scout Cookies cartridge. - All products are laboratory analyzed to ensure potency and consistency. PURE CO2 EXTRACTED CANNABIS OIL PROCESSED WITH FOOD GRADE ALCOHOL. ON/OFF: Touch the battery tip 5 times for on/off. PREHEAT: Touch the battery tip 4 times to start preheat. Longest preheat time is 25 seconds. Stop preheat anytime by inhaling or touching tip. ADJUST HEAT: Touch the battery tip 3 times to adjust heat. The colour on the tip when inhaling shows heat setting chosen. BATTERY LEVEL: Keep finger on the tip to check battery level. VAPE: Slowly draw vapour from the pen for 2-3 seconds. Hold without inhaling for 3-5 seconds. Full effects will be delayed, so start with only a few draws per session. For maximum draws, wait at least one minute between inhalations. Discreet. Distinct. Disposable. Toko offers sleek CO2 options for Cannabis vaporization. Supercritical CO2 extract formulated with live Cannabis terpenes for superior flavor and effect. All products are made with food grade materials only. Source products used for extraction are grown in a GMP and GPP environment without the use of pesticides and free of heavy metals. This electronic pen is fantastic. The pre heat function really helps. And the temperature adjustment allows for those big clouds. 10xbetter then other I’ve owned. Best purchase ever, it tasted like old school hash and after one puff I felt the effects start which is hard pressed for a heavy conosuer. Nice to puff on the way to work and back home, have already bought one refill and will be buying the three pack next. Got my pen today and I love it, easy to use and its very smooth, nice clear buzz. I already bought a 3 pak of refills. Wow wow wow wow wow happy happy wow wow extremely happy wow then the world an problems fade away epic strain pen heat setting high low med is sweeter than the phant pen more control on your vape hit nice job toko an Whitepalm amazed this is the item that had me Forrest Gump happy thank you so much for this item is a lifesaver in a way an then some! The first shipped was a bad one,but they sent me a new one again. I’m very satisfied with that. Awesome pen. high was on point and the taste was way better then anything I was expecting. The 3 different temperature settings that all work great with the oils and that price is unbeatable for the quality of goodness you get. i give a try at this one refillable pen, cause i was not satisfied with one use pen from Toko. But the Toko Gold .. OGM, it’s a bit pricy but worth it,for a good smoker who want a little extra during common day. Really Strong and it taste like good Hash. grat quality and look really nice, and the Cartridge are the same as Southcoast. very easy to use ! Best cartridge pen I have used. 3 temp options provide great smoke depending on how you are feeling or what strain you are using. 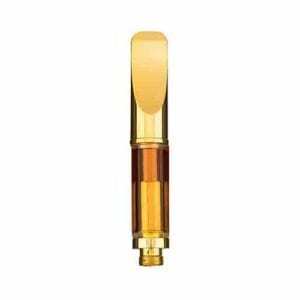 Works with other cannabis oil cartridges. … because this pen is truly “one shot, one kill”. For the weekly or monthly toker, this thing will blissfully devastate you in smaller/chiller social functions with low physical activity or as a nightcap. The actual tech is amazing, but I originally was not a fan of the CO2 taste. There definitely is one that’s a shock to the senses, but it won’t kill you and you become accustomed to it after the first few times – it only started to have that cookies taste to me after that 50th hit. Trust me – these things are good for easily 150-200 hits. And for the average casual user, a draw or two at 3 seconds each will get you feeling it. It’s clearly not the strongest Indica on the site, but for people coming from bud it should go without saying that it’s a whole different ballgame. A more convenient, smokeless, healthier, but higher concentrated ballgame. And it’s a show that’s worth the money to play in – even seasoned smokers will think that $95 and additional $70 cartridges will be well worth the price of admission with what you get out of it. will 100% have to splurge on this again. Nice, very smooth and tasty! Great pen to boot! Convenient, strong and the vapor is low odor. Plus GSC is a great strain. Loses one star only because the pen itself has a strong scent. Smells almost like it’s leaking but it definitely isn’t. I’m guessing that the oil is just that aromatic, but that does make discretion a little bit harder. It’s a great buy, just note if they are all like mine then the pen itself is a bit stinky in a telltale scent way. Took a bit to get use to but wow is it worth it! Very discreet and easy to use. Really love the different coloured indicator lights to tell you of the different settings. Don’t even bother with disposable vape pens because this one is a better investment. The pen itself is fun to use, bit you have to read the directions. As others say, the preheat function is pretty awesome. Love the gsc so much, though, that I’m going through it too quickly. Absolutely no complaints about this purchase. Toko Gold Pennywise – Weekly Vape Deal.